Trichy: Passengers have demanded that railways operate conventional coaches instead of diesel electric multiple units (DEMU) on the newly-converted broad gauge line on the Tiruvarur - Karaikudi section of the Trichy railway division. While appreciating the railways for sending a proposal to the railway board to operate two passenger trains on the line, passengers pointed out that the section was a longer one with a running time of over 3 hours which necessitated use of conventional coaches. trains have received LHB coaches, he added. The proposed passenger trains would commence operation after completion of inspection by the commissioner of railway safety between the newly converted Tiruvarur – Pattukottai section via Thiruthuraipoondi. The inspection which began on March 26 would continue for four days. The association also wanted one of the three passenger services operated between Villupuram and Madurai to be extended to Karaikudi via Pattukottai. Moreover, Pattukottai, Thiruthuraipoondi, Aranthangi needed overnight train connectivity to Chennai. Hence, new train service between Rameswaram and Tambaram via Karaikudi and Pattukottai should also be introduced along with the opening of the converted gauge section, Giri opined. “The feasibility of connecting Pattukottai with Karaikal through a direct train should be looked into and implemented in the next timetable revision. Stoppages at Pattukottai should be given to all passing trains at the introduction stage itself”, he further stated. Trial run: An electric locomotive with an eight-coach rake leaving Thanjavur Junction on Saturday. Travel time between Thanjavur and Tiruchi by rail is set to get reduced following the electrification of the track. trains would be increased bringing down the travelling time considerably. Electric locos would be pressed into service after 20 days from the date of inspection by the Rail Safety Commissioner. Almost all the works relating to the electrification of the 153-kilometre track between Tiruchi and Karaikal with a 25 kilowatt substation near Thanjavur Junction erected at a total cost of ₹250 crore had been completed. For the trial run, an electric loco hauling an eight-coach rake left Thanjavur around 3.35 p.m. Meanwhile, Railway Users’ Association of Thanjavur has sought extension of three trains originating from Tiruchi to Thanjavur and a new train to Palani. 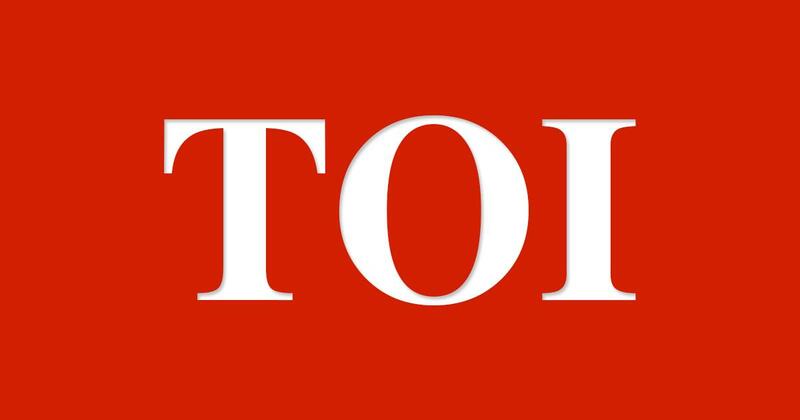 The association said the Intercity Express between Thiruvananthanpuram and Tiruchi; Howrah Express between Howrah and Tiruchi; and Palakad Town- Tiruchi trains be extended to Thanjavur for the benefit of passengers in the Thanjavur region. 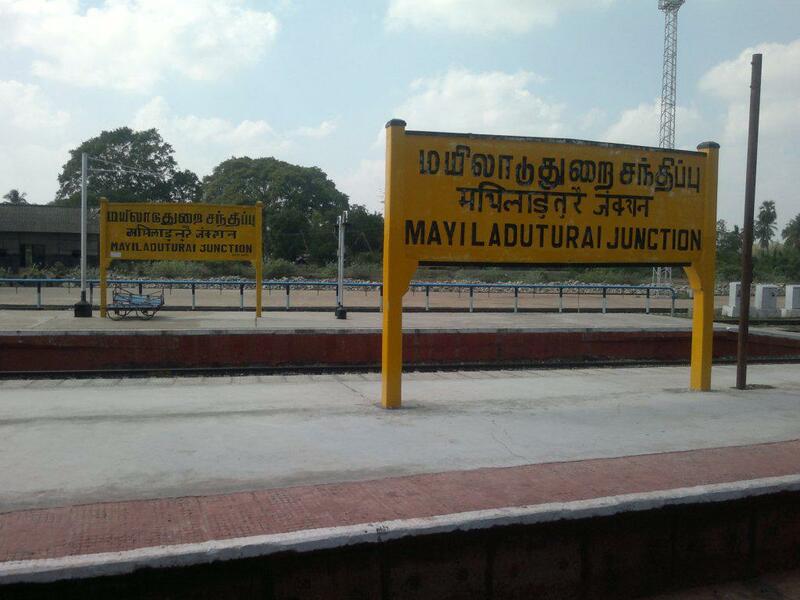 The Mayiladuthurai-Thanjavur train, which remains idle for more than seven hours at Thanjavur junction, could be extended up to Palani. 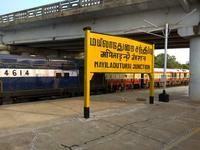 Passengers from Adhiramapattinam want the railways to revive the suspended train services as early as possible. மயிலாடுதுறை ஜன.18. மயிலாடுதுறை-தரங்கம்பாடி ரயில் பாதை 1926ம் ஆண்டு ஆங்கிலேயரால் கட்டப்பட்டது. சுமார் 60 ஆண்டுகள் நல்ல பயன்பாட்டிற்கு பின் கடந்த 1986ம் ஆண்டு ரயில்வே நிர்வாகம் எந்த காரணமும் சொல்லாமல் சில அதிகாரிகளின் தன்னிச்சையான செயல்பாட்டால் நல்ல நிலையில் இயங்கிவந்த ரயில் சேவை நிறுத்தப்பட்டது. மயிலாடுதுறை-தரங்கம்பாடி திருநள்ளார்-காரைக்கால் மற்றும் நவக்கிரக கோயில்களுக்கு செல்வோருக்கும், கடல்வழி வியாபாரம் செய்வோருக்கும், விவசாயிகளுக்கும் மற்றும் பள்ளி, கல்லூரிக்கு மாணவர்களுக்கும் பெரிதும் உதவி வந்த மேற்படி மயிலாடுதுறை-தரங்கம்பாடிரயில் சேவையை மீண்டும் துவங்க வேண்டும் என்று பல்வேறு போராட்டங்கள் அனைத்துக்கட்சிகள் மற்றும் தன்னார்வ அமைப்புக்கள் சார்பில் நடத்தப்பட்டுள்ளன. நிலையப்பணிகள் நடைபெற்றுவதால் மேலும் கூடுதலாக பயணிகள் இத்தடத்தை பயன்படுத்திக்கொள்ளும் நிலையும் எதிர்காலத்தில் ஏற்படும். மேலும் வேளாங்கண்ணி, நாகூர், திருக்கடையூர் வழியாக இந்த ரயில்பாதை அமையும் போது இந்து, முஸ்லிம், கிறிஸ்தவ நல்லிணக்கத்தை மேம்படுத்தும் ரயிலாக இது அமையும் என்பதில் மாற்றுக்கருத்து இல்லை. விழுப்புரம்: விழுப்புரம்-தஞ்சை இடையே ரயில் பாதையில் மின்மயமாக்கும் பணிகள் தீவிரமாக நடந்து வருகின்றன. இதனால் ரயில்களின் வேகம் அதிகரிக்கும். இது பயணிகள் மத்தியில் மகிழ்ச்சியை ஏற்படுத்தி உள்ளது.விழுப்புரம்-கடலுார் துறைமுகம்-மயிலாடுதுறை-தஞ்சை மற்றும் மயிலாடுதுறை-திருவாரூர் இடையே 286 கி.மீ மின் மயமாக்கப்படாததால் டீசல் இன்ஜின் பொருத்தப்பட்டு ரயில்கள் இயக்கப்படுகின்றன. இப்பாதையை மின்மயமாக்க கடந்த 2016ம் ஆண்டு ரயில்வே பட்ஜெட்டில் அனுமதி வழங்கப்பட்டது. தொடர்ந்து 2017ம் ஆண்டு பட்ஜெட்டில் நிதி ஒதுக்கீடு வழங்கப்பட்டது. இப்பணியை ரயில் விகாஸ் நிகாம் என்கிற ஆர்.வி.என்.எல் நிறுவனம் மேற்கொள்ள ரயில்வே வாரியம் அனுமதி வழங்கியுள்ளது. இதை தொடர்ந்து ரூ.239 கோடி மதிப்பீட்டில் மின்மயமாக்கும் பணிகள் தொடங்கி நடந்து வருகின்றன. இந்த மார்க்கத்தில் மின்சார ரயில்கள் இயக்க வாய்ப்புள்ளதாக தெரிவித்துள்ளனர். இப்பணிகளை கடந்த மாதம் கடலூரில் ஆய்வு மேற்கொண்ட ரயில்வே அதிகாரிகளும் உறுதிபடுத்தியுள்ளனர். இப்பாதை மின்மயமாக்கும் பணி முடிந்தால், ரயில்களின் வேகம் அதிகரிக்கும். சரக்கு போக்குவரத்தும் அதிகரிக்கும். கடலூர், காரைக்கால் துறைமுகங்கள் பெரிய அளவில் பயன்பெறும், என ரயில்வே அதிகாரிகள் தெரிவித்தனர். ரயில்களின் வேகம் அதிகரிக்கும், கூடுதல் ரயில்கள் இயக்கப்படும் என்ற தகவல் பயணிகள் மத்தியில் மகிழ்ச்சியை ஏற்படுத்தி உள்ளது. 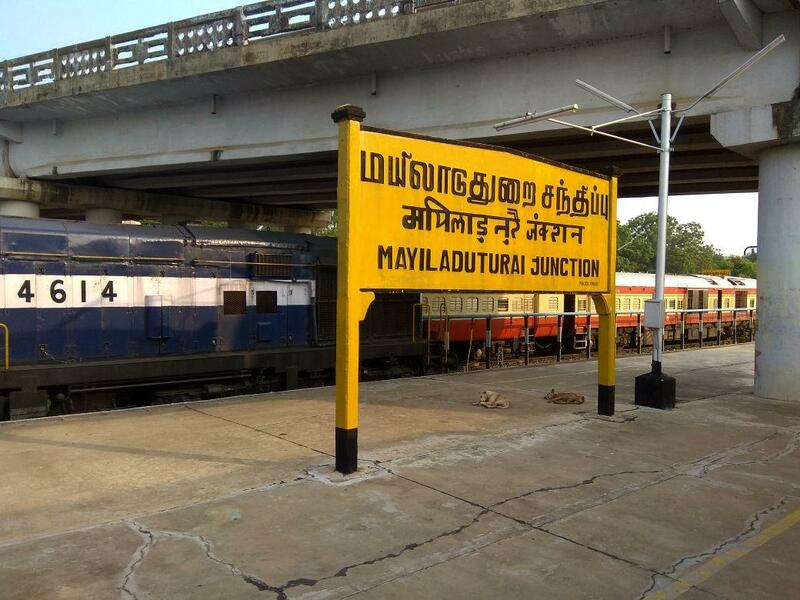 Trichy: Regular railway passengers from Trichy, Thanjavur and Mayiladuthurai have appealed to the Southern Railway to operate the Tambaram-Sengottai Antyodaya train as the train had good patronage when it was operated as a special train. visit temples located in and around Trichy, Thanjavur, Kumbakonam and Melmaruvathur, they said. The train was included in the timetable released on November 2017 and the railway announced it again in August 2018. However, nothing has happened, said R Rajan, a regular commuter from Thanjavur. In December 2017, the train was operated between the sections as a special train. Citing line block between Kumbakonam and Mayiladuthurai, officials suspended the service. Later, the special was brought into a halt stating scarcity of rakes. However, there was no word about the train from the officials, Rajan, who is working at a private company in Thanjavur, added. According to officials at Trichy railway division, a new rake is ready for the train at Tambaram. If the rake is ready for use, the officials should initiate steps to operate the service, commuters said. Member of DRUCC and Thanjavur District Rail Users Association A Giri said the officials’ announcement may be delayed. In the meantime, the railway should announce the train as a special and can be operated without wasting the rakes. Meanwhile, officials at Trichy railway division said that the Tambaram-Sengottai Antyodaya express will be operated after getting orders from the railway board.